Cycling was the most popular form of outdoor activity in the 1890s. Men and women alike were encouraged to cycle for exercise and enjoyment, with many different styles and designs of bike available. 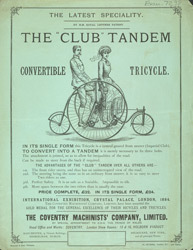 The Coventry Machinists’ Company’s tricyle, advertised here, could be converted for use by two people. Women in particular were encouraged to ride tricycles, which were considered less dangerous and easier to use while wearing long skirts.